Jason returns to NECAâs quarter scale action figure line! This massive, all new 18â figure is based on his appearance in Friday the 13 Part 4: The Final Chapter and features plenty of gruesome detail. You can even recreate his (not quite) fatal wound by sliding his machete into the side of his head. 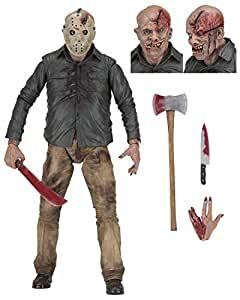 The figure has over 25 points of articulation and is packed with accessories: removable mask, two interchangeable head sculpts, interchangeable hands, knife, machete, and axe.